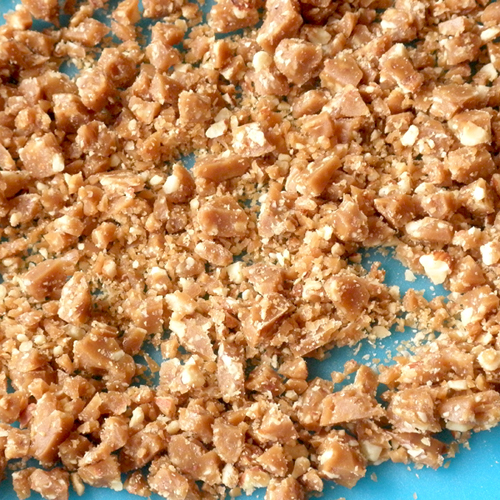 Often, when I make English toffee, I end up with extra melted chocolate, extra bits of broken toffee, and extra almonds. I like to mix them all together and make these little nuggets of goodness. The ones you see here were not made from leftovers, but were made intentionally: intentionally made toffee with extra small bits of almond and Dove Dark Chocolate Promises unwrapped specifically for this purpose. These taste just as delicious when you use milk chocolate, but I decided to mix things up a bit with the dark. 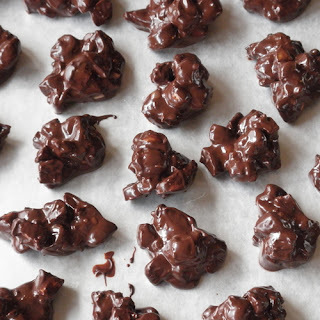 The beautiful thing about these is that when you bite into one, you taste all three of the ingredients on their own: first the smooth dark chocolate, and then the buttery crunchy toffee, and then the hearty toasted almonds. Mmmm... They are much like Symphony bars, except with dark chocolate and more toffee and almonds. It would probably be best to just make these around Christmastime so I can give them all away and not risk eating too many on my own. These you see here, along with all of their buddies, are heading to Florida tomorrow for my brother's Air Force retirement festivities. I should probably go get him a card too, or something. Enough said. I don't know how to finish this post after that statement. Have fun, and enjoy! If your almonds are not yet roasted, spread them evenly on cooke sheet and roast at 325 degrees Fahrenheit for about 15 minutes, or until lightly toasted when you cut into one. Set almonds aside to cool. 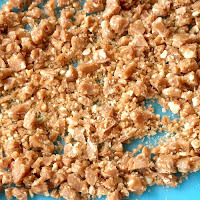 If you are making your toffee bits, follow the recipe below. Feel free to use Heath toffee bits, though. Roughly chop almonds--I usually cut each into half or thirds. Yes, I actually do cut only one or two at a time for this, but I'm a little nuts (pun possibly intended). 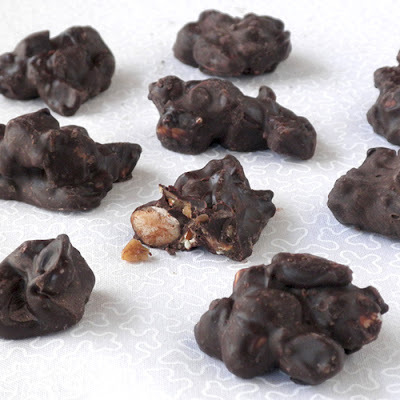 Stir chopped nuts and toffee into melted & tempered chocolate until thoroughly coated. Drop teaspoon sized blobs onto parchment or wax paper lined cookie sheet, making sure they don't touch. Allow to set in a cool, dry place until chocolate is no longer tacky to the touch. If you've tempered your chocolate right, it should take about two hours for the chocolate to firm up at a reasonable room temperature (72 degrees Fahrenheit). Then, remove from parchment/wax paper and store in a zip-top bag or other airtight container. Gee, I don't know how much this makes, but it's a LOT. Enough to fill up a 13"x18" half sheet pan with less than 1/4 inch between blobs. 2. In a heavy saucepan heat butter and sugar to boiling over medium heat, stirring constantly. Boil over medium heat until it reaches 300° on a candy thermometer. At that point immediately stir in the half cup of chopped almonds. Pour into prepared pan and evenly spread with a silicone (not rubber) spatula. Allow to cool completely. Makes almost 2 cups of toffee bits. Use the extra to make some toffee chocolate chip cookies or use as an ice cream topping. They'll keep in a zip top bag for a few weeks as long as you keep them in a cool, dry place.